Off the top of my head, there’s really just one major benefit to owning a set of self sharpening knives, and it’s the fact that you no longer need to sharpen them at all. You see, self sharpening knives usually come with a single container or a knife block that has a a built in knife sharpener. This way, the knife gets sharpened every time you place it inside the container or the knife block. Because of so, self sharpening knives are deemed to be low-maintenance pieces of cutlery. 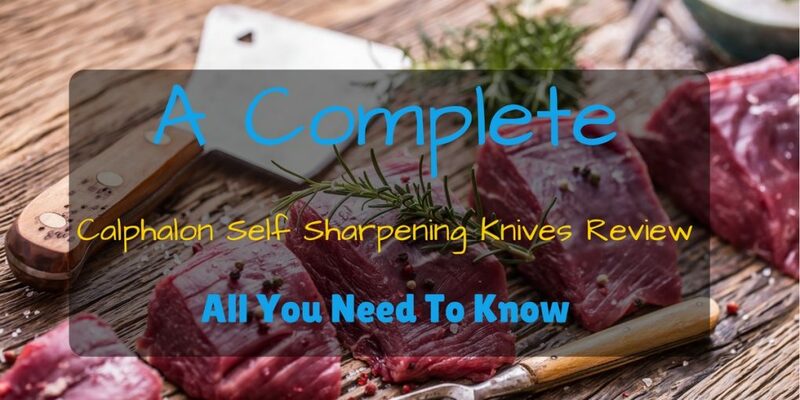 What I like best about self sharpening knives is that they completely eliminate the risk of damaging the knife itself, especially since sharpening knives isn’t that easy. As for the cons, self sharpening knives tend to get worn out faster than normal knives. Why? Because as a good rule of thumb, you’re only supposed to sharpen a knife once or twice a year. Sharpening your knife more frequently than that can cause the knife’s blade to get thinner since the metals get peeled off during sharpening. Nonetheless, self-sharpening knives are great pieces of cutlery that you can rely on for perfectly cut ingredients. To ensure that you get the most out of your purchase, you must first get familiarized with the important features that come with a cutlery set. Knives and other pieces of cutlery can be made with different materials including ceramic, stainless steel, and carbon steel. I personally prefer going with carbon steel pieces of cutlery since they tend to be the most durable. When choosing a knife set, you must make sure that the set you are getting comes with all the kinds of knives you need. A knife set can come with as little as 4 knives up to 18 pieces. Some sets even come with honing rods and poultry shears. Another thing that can help you determine which knife set you should choose are the accessories or freebies that come with it. Most knife sets come with chopping boards, honing rods, and knife blocks. If you’re the kind of person who doesn’t like to exert much effort into maintaining pieces of cutlery, then I can sincerely recommend this 18-piece Calphalon self sharpening knife set for you. 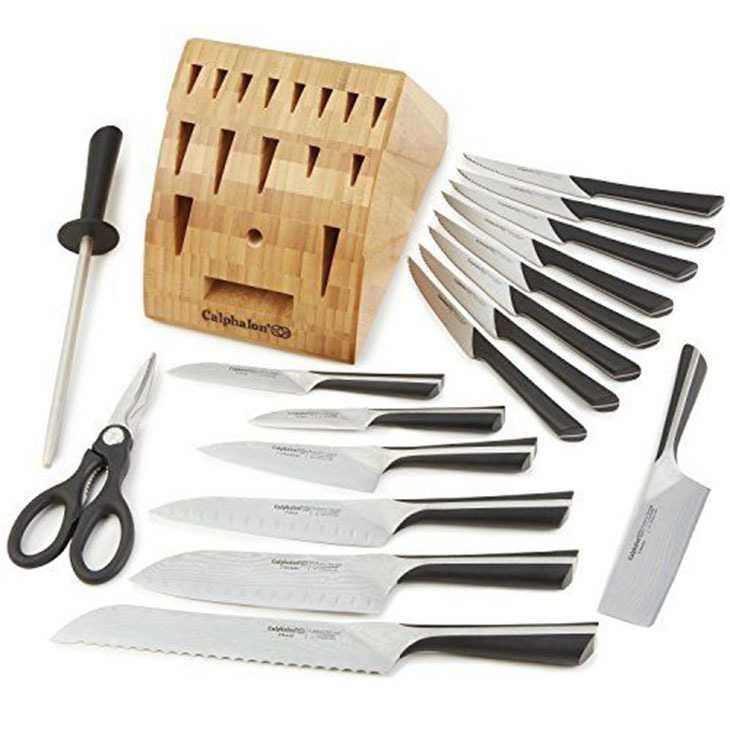 This set includes 18 pieces including an 8-inch chef’s knife, an 8-inch bread knife, a 6-inch santoku knife, a 6-inch utility, 6-inch serrated utility, a 4 ½ and 3 ½ parer, an 8-inch honing steel, poultry shears, and 8 steak knives. What I like about this set is that every knife that comes with it has a full tang design that will allow you to gain better balance and overall maneuverability during use. Another great thing about this set is that it is extremely durable since it is made of high carbon no-stain steel. Another great thing about the knives in this set it that it comes with triple riveted handles that are just great to hold. Every knife in this set comes with the perfect balance for comfort and efficiency. 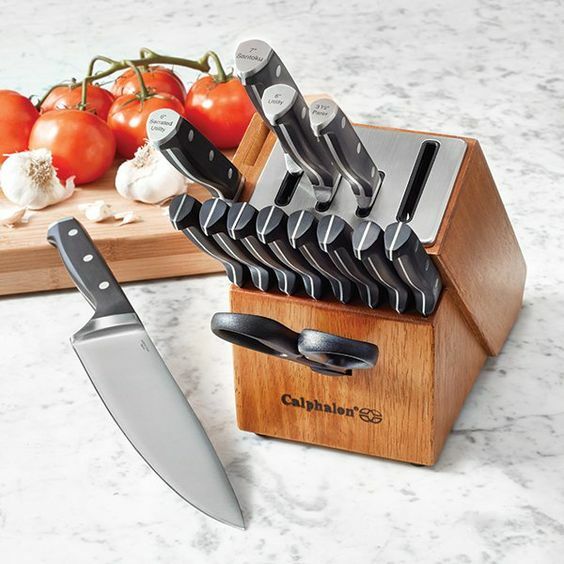 Another great knife set that you don’t have to sharpen yourself is this Calphalon Classic Self-Sharpening Cutlery Knife Block Set with SharpIN Technology. 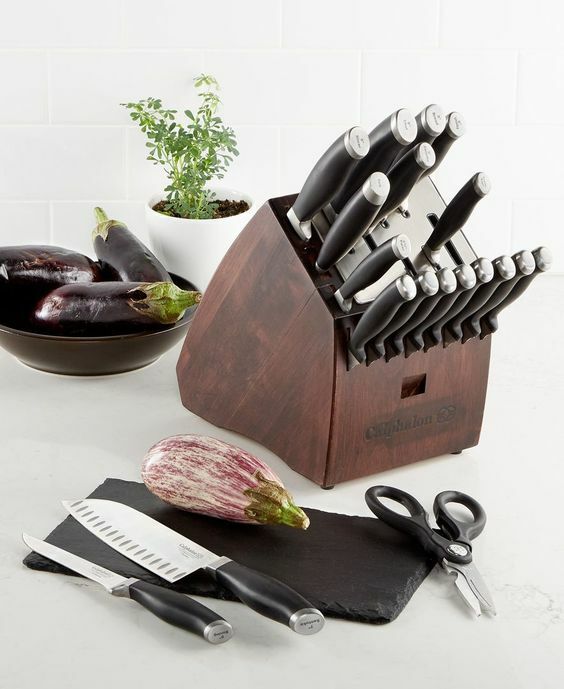 If you decide to get this set, you will avail an 8-inch chef’s knife, a 6-inch serrated utility knife, a 5-inch santoku knife, a 4.5-inch parer, 6 steak knives, a pair of poultry shears, and a knife block equipped with SharpIN Technology. What I like about this set is that every piece of cutlery it includes is made with very durable high carbon no-stain steel. Without a doubt, all of the knives in this set will stay sharp edged for the years to come. 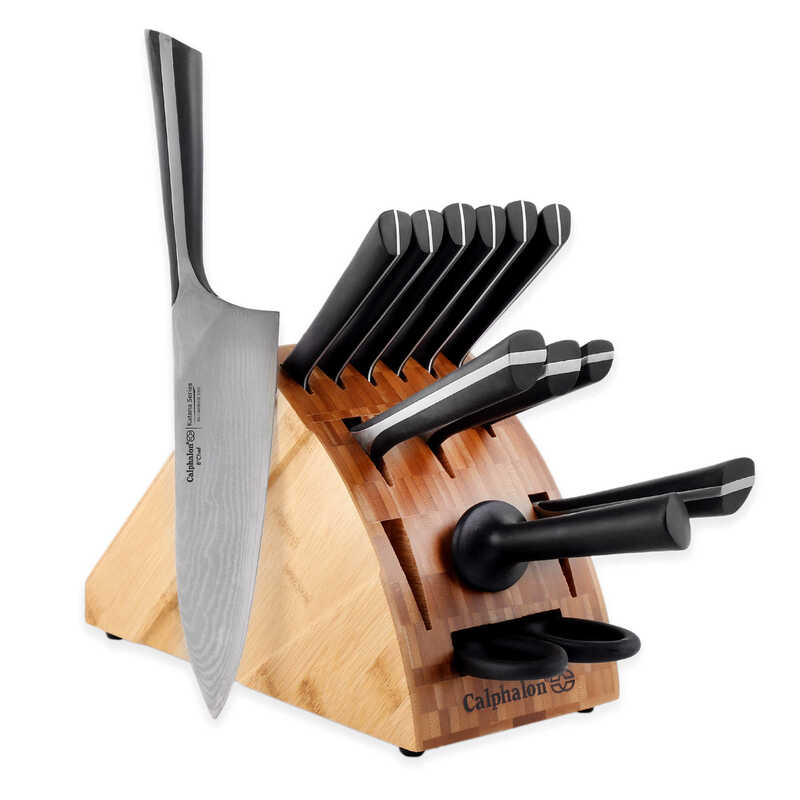 The knife block that comes with this set has built in ceramic sharpeners that keep each knife sharpened whenever you place your knives in it. The knife block itself is also very stable and doesn’t tip over even when it’s not full. 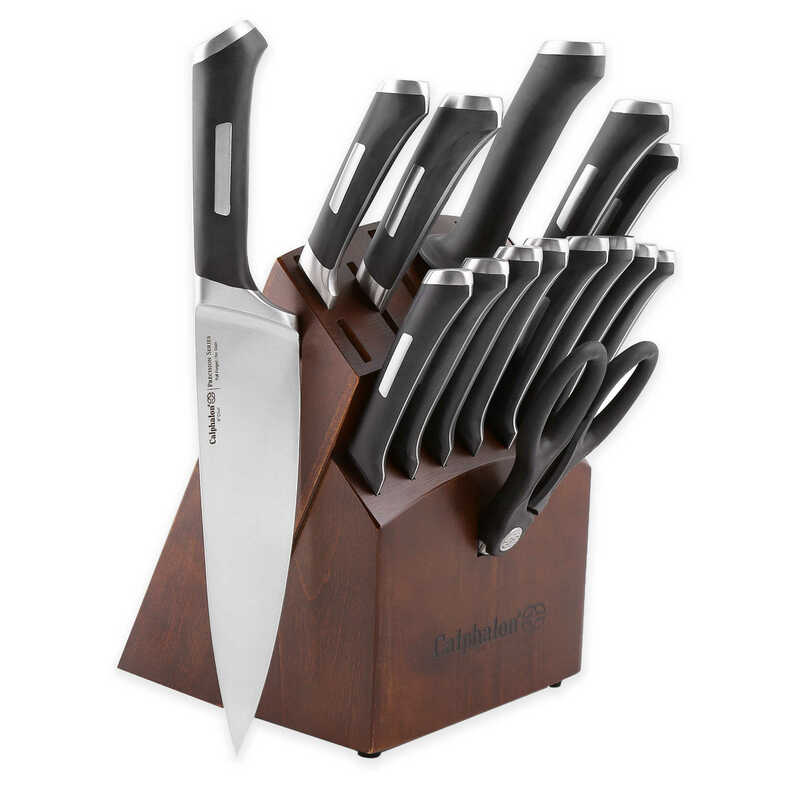 Another great knife set that you don’t have to sharpen yourself is this Calphalon 12 Piece Contemporary Space-Saving Self-Sharpening Cutlery Set. What’s great about the knives in this set it that it comes with triple riveted handles that are just great to hold. Every knife in this set comes with the perfect balance for comfort and efficiency. ​Perhaps the only downside to this product is that it is highly corrosive, which is why you have to make sure that it is completely dry before you store it away. It’s also not dishwasher safe. 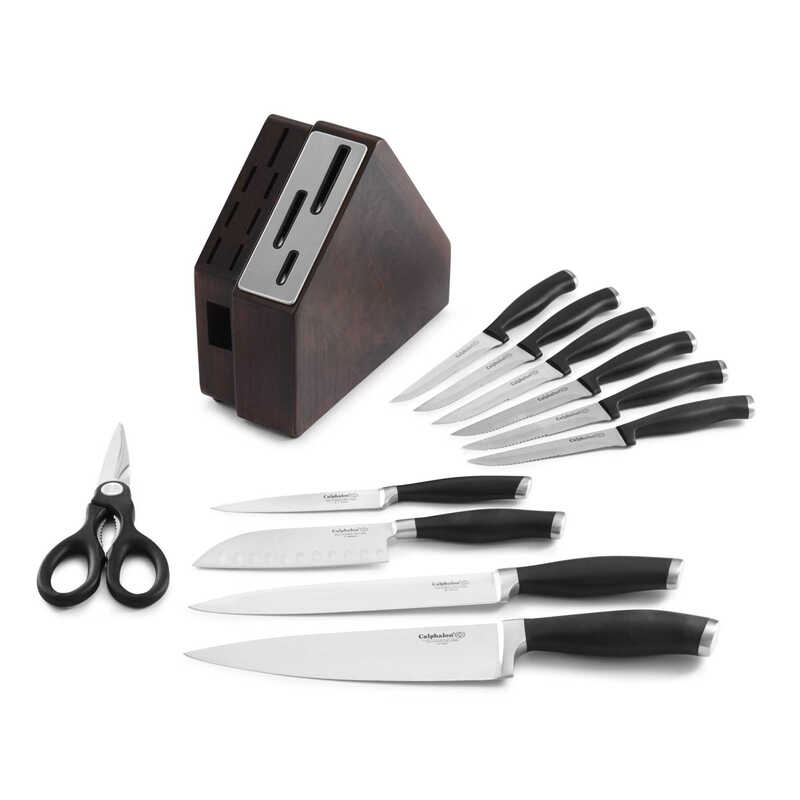 ​If you decide to get this set, you will avail an 8-inch chef’s knife, a 6-inch serrated utility knife, a 5-inch santoku knife, a 4.5-inch parer, 6 steak knives, a pair of poultry shears, and a knife block equipped with SharpIN Technology. 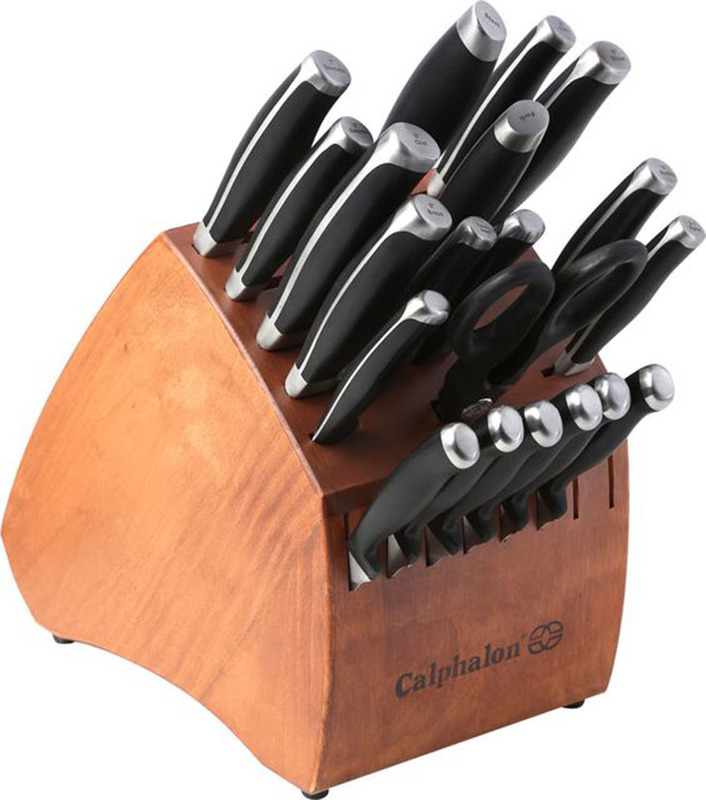 Another great knife set that you don’t have to sharpen yourself is this Calphalon Classic precision series cutlery set. Perhaps the only downside to this product is that it is highly corrosive, which is why you have to make sure that it is completely dry before you store it away. It’s also not dishwasher safe. This Calphalon katana cutlery set is probably one of the most attractive knife sets in this list. What makes this set a very attractive one is its blade that is made with 33 stainless ﻿﻿steel layers that give it its unique style. What’s great about this set is that it comes with patented handles that are very ergonomic in design. The handles have been contoured to provide you with comfort and balance for complete control during use. Perhaps the only downside to this set is that it is not dishwasher safe. To avoid damaging the blades of the knives in this set, you must hand wash each of them. These blades can also catch rust since they’re not rust-proof. Another thing I liked about this set is its very stable knife block. Unlike other knife blocks that pose a serious hazard when half empty, this one doesn’t tip over even when it’s not full. 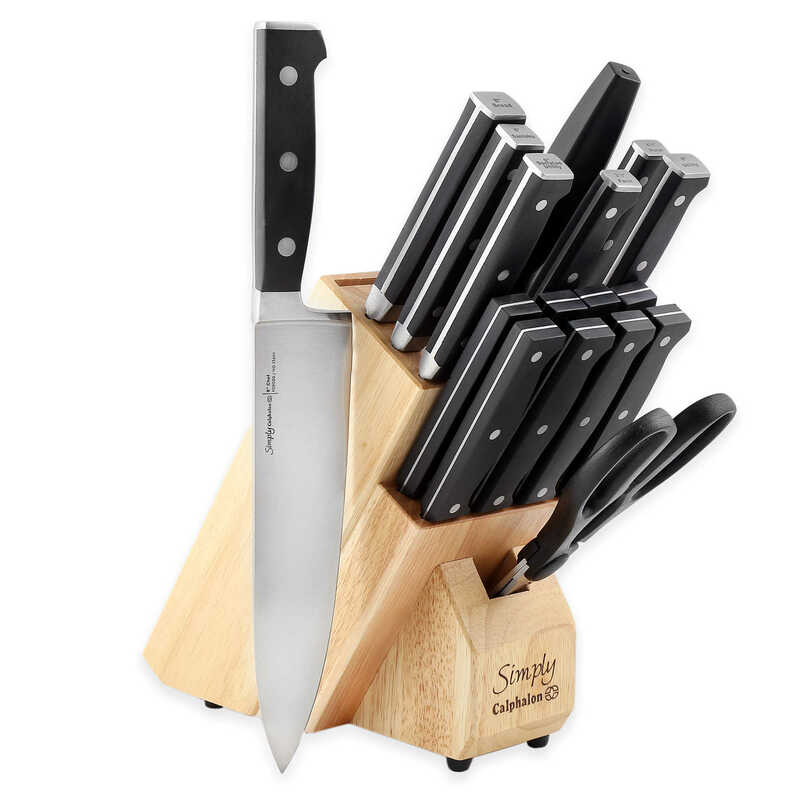 It’s knife block doesn’t only make for safe storage for your knives, but for yourself as well. Needless to say, this self-sharpening knife set is truly a remarkable piece of work, especially since it is unlike other sets I have included in this list because of its Japanese style build. With this set at your disposal, you’re practically holding a tiny katana in your hand. 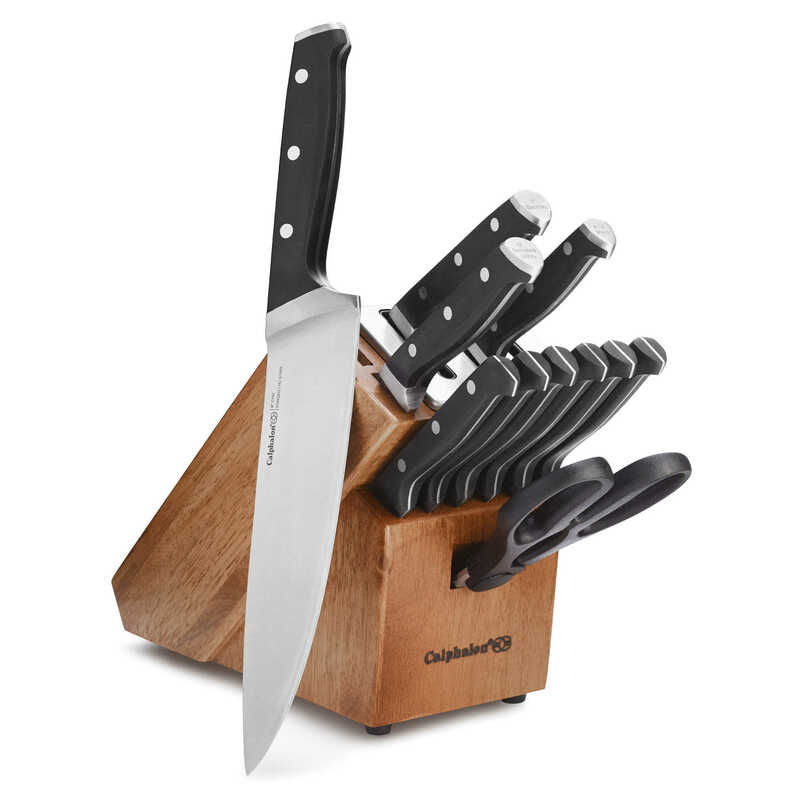 Calphalon Katana Cutlery 14-Piece Knife Set is a great choice for any home cook who doesn’t really have the time to maintain every knife’s sharpness as time passes by. What makes this set the best of the best is its unique Japanese build where 33 layers of durable stainless steel is forged to create a single blade. Without a doubt, this self sharpening knife set will surely give you the best value for your money.